Good morning everyone! It's Thursday and that means sharing my weekly Avery Elle project:) Today I've got a graphic card for you made with the new Signature dies! This nested die set has so many possibilities! For this card, I used 3 layers of colored vellum cut randomly with the different sized dies. I layered the cuts so that different combinations of layers show through the apertures. Love how it turned out! Wow. This card is LOVELY. Love all the different layers you created using the negative space on colored vellum!! Thanks for sharing! Such an eye catching card! Love the color combo! This is one cool and fun card!!! Love it! Genius idea to use 3 layers of colored vellum! 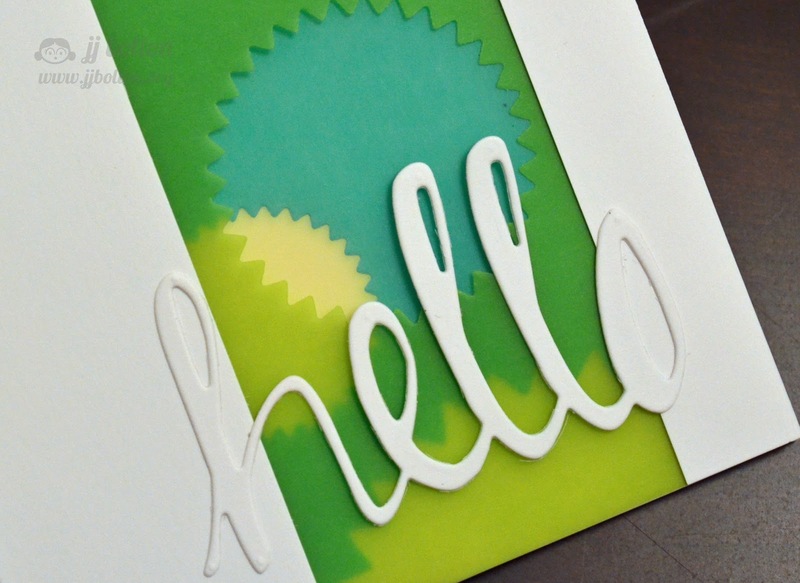 I love the graphic shapes, and the hello die cut is so fun! Another really awesome card, JJ! Hi JJ! Well, I commented on this one a couple days ago when I was on a public computer at the car shop ... apparently that didn't work out! But, I had to let you know just how cool I think this is!! You're the best at taking common supplies and making something extraordinary out of them. The layered vellum is stunning! very nicely done...love the strategically placed die cut windows.